was posted on October 16th, 2014 at 10.19am. This entry has no comments (yet). You can follow any responses through the RSS 2.0 Feed. 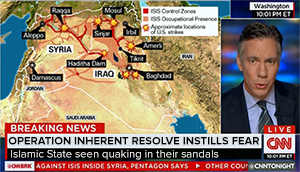 After two months of air strikes and a lot of careful thought and consideration, the Pentagon announced yesterday that it had come up with an official name for the war on Islamic State – Operation Inherent Resolve. Apparently Operation Wishy Washy was rejected as being too forceful and militaristic. Not only will the new battle slogan instill fear – maybe even shock and awe! – in the enemy, but it will look really good on CNN and Fox News when they flash it on the screen accompanied by the strains of 101 Hollywood Strings performing “Oops! I Did It Again.” Heck, even the lame Invasion of Grenada in 1983 was called Operation Urgent Fury. Not to be outdone, the Surgeon General announced today that the fight against Ebola would from now on be officially known as Operation Try Not to Catch It.